Night had fallen on the Atlanta Stadium in the city of Buenos Aires on November 19, and as “The Internationale” began to blare from the loudspeakers, more than twenty thousand people at the Trotskyist Left Front rally stood up, their fists held high, to sing the international workers’ anthem with a single voice. Among them were women who had taken part in recent nationwide actions against gender violence under the slogan #NiUnaMenos, workers fighting against layoffs and pay cuts or operating recovered factories that are now under workers’ control, and students and teachers from all over the country. The event took place not as a demonstration of support for an electoral campaign or a response to a specific political event, but as a conscious step toward the construction of a revolutionary political alternative. Just days after the election of Trump in the United States and after the turn of the “pink tide” had brought with it the advance of the right in Latin America, including the “institutional coup” in Brazil and the election of Mauricio Macri in Argentina, this was a massive demonstration of strength by an anti-capitalist force that promotes workers’ power and self-organization. How was this accomplishment possible? After the outbreak of the 2001 economic crisis that led to the downfall of then-President De la Rúa, and in response to widespread protests, Argentina underwent over a decade of post-neoliberal policies under the Kirchners. These policies included an increase in social spending and were aimed at allaying the prevailing social unrest but, nonetheless, failed to provide real, lasting solutions for the working class while billions in taxpayer funds were paid in foreign debt and subsidies to privatized firms run by the government’s cronies. In late 2015, this cycle was interrupted by national elections that brought to power the right-wing political party, PRO, which had based its campaign on a call for changes that would put a stop to corruption. Today, under the leadership of President Macri, the government serves the interests of domestic and international capital perhaps more blatantly than any other administration in recent history. One of the first policies put in place by the new government this year was a currency devaluation that has led to a brutal rise in inflation which, in turn, has had a severe impact on the standard of living for the poor and working classes. Massive layoffs in the public and private sectors have followed, as well as dramatic hikes in transportation and utility fees. Meanwhile, the government has paid out millions to vulture funds and has started a new foreign debt cycle. In the face of these policies, not only has the Peronist party (Frente para la Victoria), led by Cristina Kirchner, failed to build a strong opposition to the governing party, it has actually put in place its own austerity policies in the provinces it governs. In Congress, it has supported the most brutal bills put forth by PRO, along with the rest of the rival capitalist parties. In this scenario, the Frente de Izquierda y de los Trabajadores (Left and Workers’ Front), which promotes working-class independence from an anti-capitalist perspective, has emerged as the only real alternative, in the eyes of an increasing number of workers, to these austerity policies. Since the 1940s, the bourgeois populist Peronist party has been the strongest political force among workers and unions in Argentina, particularly due to the monopoly it has enjoyed over government resources throughout extensive periods. However, revolutionary socialist politics have gained momentum among large sections of the working class over the past 15 years, despite the renewed strength of the Peronist party during the Kirchner years. Since the crisis in 2001, several factories and workplaces have been taken over, some of which now remain under workers’ control, and workers’ committees have sprung up to organize democratically and fight against union bureaucracies. Today, as workers are confronting massive wage cuts and layoffs and there is a growing criminalization of protests, the struggle to recover unions and place them back under the control of the workers has become increasingly urgent. Despite recent attacks waged on the working class, the CGT (General Confederation of Labor—the largest workers’ federation in the country), has not called a single strike, while the CTA (Argentine Workers’ Central Union) has only organized isolated demonstrations and strikes. This failure of the CTA to mobilize is due to its use of a Kirchnerist policy of opposition to Macri; that policy, in turn, supports a strategy of class conciliation. The Left and Workers’ Front has been demanding that the national leadership of these federations call an active general strike against the government’s austerity policies, mobilizing thousands of workers across the country, as part of a progressive action plan aimed at overturning the administration’s anti-worker policies. The fight against the union bureaucracy is a practical way through which members of the Left Front have won the confidence and support of their co-workers in workplaces all over Argentina. Some landmark struggles have transcended factory fences and have become beacons of struggle and resistance, such as the printing company MadyGraf and the ceramic company Zanon, both of which are under workers’ control and orient production to meet the needs of the community. One of the exceptional characteristics of the Left Front has been its ability to reconcile workers’ organizing and struggles with revolutionary politics. The coalition includes three Trotskyist political forces: the PTS (Partido de los Trabajadores Socialistas, Party of Socialist Workers), PO (Partido Obrero, Workers’ Party), and IS (Izquierda Socialista, Socialist Left). The three organizations are united under a program that emphasizes class independence in an anti-capitalist struggle to build a socialist workers’ government. Throughout the course of its history, the Left Front has taken steps toward restoring the link between the revolutionary left and the working class, rejecting center-left alternatives of submission to capitalist parties and keeping its distance from the “nationalist” or “progressive” governments of Latin America, which, despite tensions with imperialist powers, have preserved capitalist property relations. 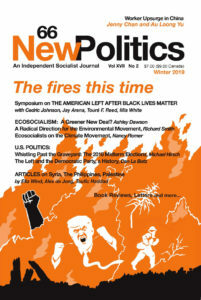 In recent years, the Left Front has also had growing electoral success, garnering 3.27 percent of the vote in last year’s presidential elections (a higher percentage than either Gary Johnson or Jill Stein in this year’s U.S. elections) under the slogan “Capitalism can’t go on!” The coalition also has four seats in the National Congress and dozens of city council representatives. Myriam Bregman, one of the Left Front’s National Representatives in Congress, was one of the speakers at the massive rally on November 19. She emphasized the significance of the recent emergence of women’s struggles throughout the world, which have included powerful actions carried out by the Argentine women’s movement in the past few weeks, with marches and work stoppages against gender violence under the banner of #NiUnaMenos and the massive National Women’s Conference last October. Bregman called for government action to protect women from gender violence, the legalization of abortion, and equal pay for equal work. She expressed the need to strengthen the fight for women’s rights by creating women’s committees in every workplace and organizing massive marches for the Day for the Elimination of Violence against Women on November 25 and for the Gay Pride demonstration. Alongside the rise of the far right in the United States and Europe, movements of resistance have taken different forms. Those tied to bourgeois political parties, such as the massive movement behind Sanders in the United States, have revealed their limitations—no real alternative for the working class can come from subordinating the people’s needs to the needs of bourgeois political structures. Reformist parties like Syriza and Podemos in Europe have shown a willingness to compromise their program as a tradeoff for access to power positions in the short run. In this context, the revolutionary left that is gaining traction in Argentina proposes a clear anti-capitalist political program for workers’ power and has shown its purpose of playing the long game in the fight for socialism. Marisela Trevin is a journalist and translator. She writes for Left Voice and La Izquierda Diario Argentina. Juan Cruz Ferre is a political activist and PhD student in sociology at CUNY. He is editor of Left Voice.